Chinese artist Wan Liya paints natural sceneries inspired by traditional Chinese paintings onto ceramics of contemporary household items. Soda bottles and soap dispensers become highly decorative objects, blurring the line between traditional and contemporary craft. Each piece has its own detailed illustration—some feature birds perching upon blossomed trees, while others depict rugged mountainous forms. However, when the objects are arranged together, they compose a larger picture. The images are inspired by Wang Ximeng’s 12th-century painting One Thousand Li of Rivers and Mountains, a large piece depicting mountains and lakes meticulously painted on Chinese silk. Influenced by Wang Ximeng’s skill and craft, Wan Liya reinvents his traditional Chinese style by placing the imagery onto contemporary objects, elevating the meaning and beauty of ordinary, everyday items. To view more of his work visit the China Design Centre’s online gallery and visit Wan’s website. The Yiwu International Trade Market in China is the world’s largest wholesale market, stretching nearly five miles and containing over 75,000 individual vendors. 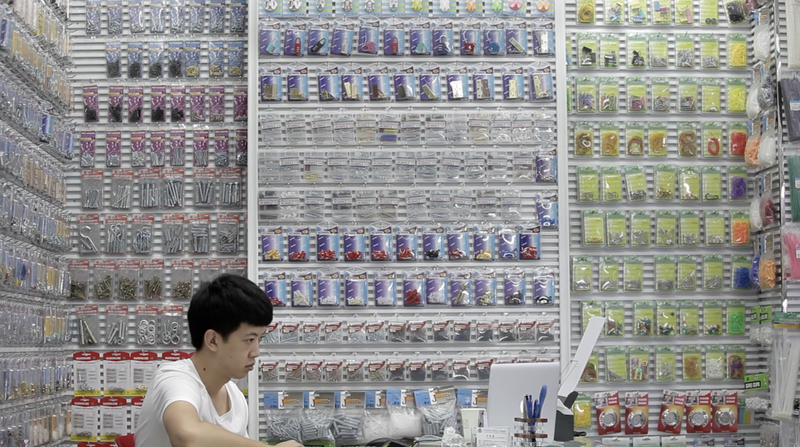 Chinese-American film director Jessica Kingdon peeks into the daily lives of the market’s workers in her observational documentary Commodity City, exploring the subtle interactions that occur amongst hoards of dolls, flowers, neon signs, clocks, and other consumer goods. This past February architectural photographer Andres Gallardo Albajar traveled to the Great Wall of China where he was able to take in a rare sight—one of the seven wonders of the world without a single soul to be seen. Albajar had expected to create the same tourist-filled images as others who visited the architectural feat, however when he arrived he found a thick fog encapsulating the structure. The dense cover may have been a deterrent for tourists, but this particular weather added further mystery to the deserted landscape Albajar captured in this recent series. “I was expecting big amounts of people, even lines to access or things like that, but for my surprise there was very few people, which allowed me to capture the wall with no people, which in my opinion helps to create a more surreal and magic feeling,” Albajar tells Colossal. You can view more of the Spanish photographer’s work, including his multi-part series on urban geometry, on his website, Instagram, and Behance. 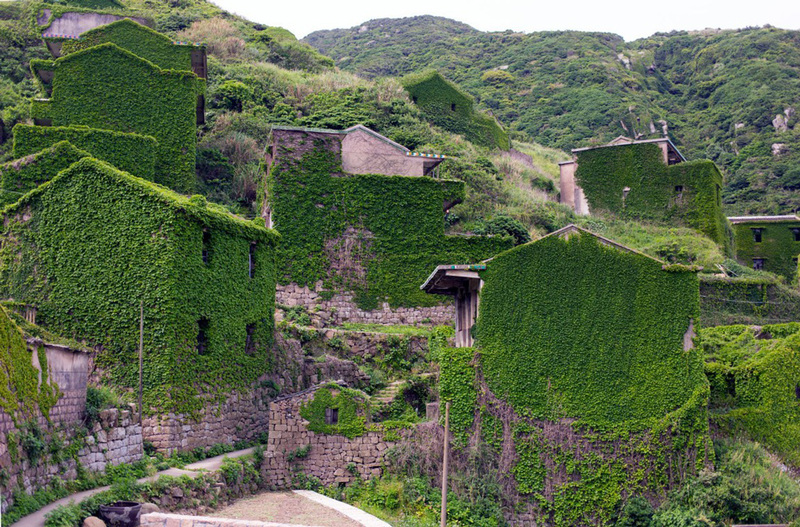 The small fishing village of Houtouwan on the Chinese island of Shengshan has been abandoned since the 1990’s. Due to increased competition with nearby Shanghai and a depleted fishing supply, residents were forced to find work in other towns, leaving their own coastal village to the whim of Mother Nature. Today the ghost town is only visited by tourists curious to see the vine-wrapped homes and other buildings swallowed by untamed greenery. Shanghai-based photographer and videographer Joe Nafis visited the area last year with fellow photographer Dave Tacon. It took them nearly 36 hours to reach the village due to lack of ferries or connection with other towns in the area. Once in town, Nafis explored the area on foot, as well as from above with his drone. Warren King began sculpting with cardboard as an attempt to add fantasy to the lives of his children, creatively crafting masks and helmets out of the recyclable material. This slowly evolved into a more time-consuming arts practice as King began focusing less time on costumes, and more time making large sculptures of his own. After a visit to his grandparents’ village in Shaoxing, China, the New York City-based artist felt compelled to more deeply connect with his cultural past. This sparked Grandfather’s Friend, and Arrival Times, a series of life-size cardboard recreations of his ancestors. King’s cardboard sculptures will be shown in the exhibition Art of Asia at the Peninsula Fine Arts Center from February 2 to March 28, 2018. You can see more of his work on his Instagram and Flickr.